Summary : This is far from the strongest of mint teas, but it is still flavorful and enjoyable. Indeed, this light tasting mint tea in many ways makes for a superb evening or bedtime tea. Review : In a past life, it would not surprise me if I was one of the dogs used in Pavlov's experiments. You see, I love mint. Anything mint. If something says mint, it is about a virtual guarantee that sooner or later I will try it. I just have been "trained" to love mint in all forms and will salivate over the chance to simply try something new that contains mint. And so it happened that during my last order with the Dragonwater Tea Company (now out of business) that I ordered a sampler pack of their Valerian Mint Tea, a herbal tea. I knew immediately after opening the package that I was probably going to like this tea to some degree. And not just because it said "mint" on the cover...although admittedly that helped. Instead, the reason was because of this teas beautiful aroma - the ever wonderous aroma of spearmint and peppermint. And for a mint lover, who can resist peppermint or spearmint? 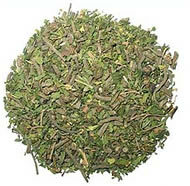 The Valerian Mint Tea from Dragonwater Tea Company (now out of business) contains the following ingredients : Valerian Root, Peppermint and Spearmint. Valerian Root, if you are not familiar with it, is a herb that has many medicinal uses, including apparently, uses to relieve insomnia. So in some ways this tea is in some ways similar to chamomile teas, which also can relieve insomnia. And indeed, the similarity with chamomile teas doesn't stop with its potential ability to relieve insomnia. One thing I found immediately striking about this tea is how similar in taste it was to the Tazo Calm Herbal Tea, a chamomile tea that contains spearmint. The taste of this tea is one the light side. It is by no means a true "peppermint tea" or "spearmint tea"...or even a strong mix of the two like some other teas I've tried. Yet, that isn't the teas purpose here. Instead, this tea is meant to be light. The after-taste is not supposed to linger around for hours. And the reason for this is because this really is, despite not being advertised as one, a evening and bedtime tea. Lipton Orange Herbal Tea : A weak tasting bagged tea from Lipton that tastes a bit of oranges.